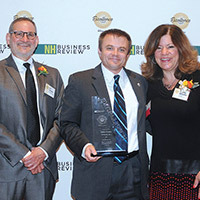 Manchester, NH – Dylan Cruess, TFMoran’s chief operating officer, was presented the 2017 Business Excellence Award in Real Estate and Construction by NH Business Review. The award reception was held on November 1 at the Radisson hotel in downtown Manchester. This event recognizes the imagination, hard work, innovation, and achievements of New Hampshire business owners and operators. “Dylan’s leadership, work ethic, passion for community involvement, and vision for TFMoran are why he is being honored with this award,” announced Mike Morin, NHBR’s award presenter. “Mr. Cruess and the leadership team at TFMoran have steered the company through a period of unprecedented growth since taking over in 2013. Because of his unusual background, he understands the engineering, surveying, and project management more than a typical COO.” Morin adds, “That understanding has enabled him to continue the original client-focused vision of TFMoran while strategically growing the company to new levels”. “Encouraging teamwork among all employees is one essential ingredient to the company’s success,” Cruess explains, “as well as a positive work culture, and giving back to the community.